This card has taken me a lot of time. October was a pretty busy month for me with my hasband being away for 3 weeks, so I missed stamping and the new stamps and other craft gifts my husband brought me from his trip to Nevada made me jump from joy and find time to create:) I enter this card into Bring on the Bling challenge. 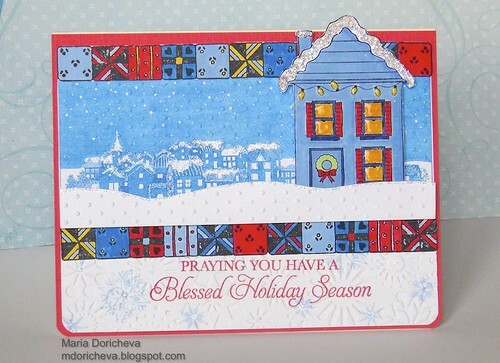 I colored my whole stamp with markers and double stamped Winter Town to create a wider background. For the snow hill I traced and extended it further, embossed with Swiss dots and added diamond stickles and used mounting tape for dimension. The quilt border is originally 6 blocks long, so it had to be elongated too. The house was colored with Memento markers as well. I used glossy accents for the windows and Christmas lights, covered the roof snow with ice stickles. The sentiment comes from a gorgeous Nativity set by Hero Arts called The Greatest Gift. I tried different inks and markers for the sentiment. I stamped the sentiment with Versamark, added snowflakes colored with a marker and them embossed with panel with Snowflakes embossing folder and made a slight mistake using the wrong side of the folder. But it was a happy accident, I loved that side too, it made it easy to fill the embossed dots with stickles.